Swampcult's sophomore Trad/Atmospheric mix does genuine justice to its Lovecraft inspiration. Irony (noun, /ʌɪrəni/): the case that, to a genuine fan, the most shuddersome and vertiginously terrifying word to come out of Howard Phillips' legacy could well be 'Lovecraftian', most frequently a label carrying the coded meaning of "a dire warning that what is to follow will be some soul-shrivelling exercise in - at best - imitative pastiche, and - at worst - missing the point by to a degree measurable only by vast, non-Euclidean angles". There are honourable exceptions, of course, such as any movie starring Jeffrey Combs, or Brian Lumley's 'Titus Crow' series, but even those tend to fall short of H.P. 's uniquely nihilistic, yet beautifully descriptive, visions of horror. 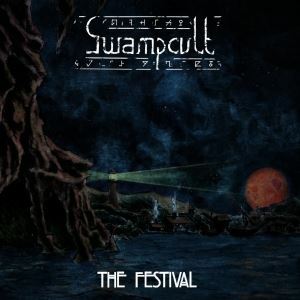 Which brings me to Swampcult's latest offering, 'The Festival', due for release on the Transcending Obscurity label - more usually noted for supporting various brutal Metal genres - in early October. It's certainly modern-day 'Lovecraftian' in look, right down to the bonus 'Arkham Horror' boardgame-styled storycards, full of flavour text and authentically disturbing illustrations, which accompany the similarly-themed CD booklet containing the lyrics. Fortunately, that's presented in a slick, yet tastefully understated, manner rather than one of tentacular excesses, making it a good start. So is the choice of material: 'The Festival' is considered one of Lovecraft's very first Mythos stories, describing the ancient generational call to celebrate pre-Christian Yule rituals in the town of Kingsport, where the protagonist soon discovers, in a weirdly-twisted outside-normal-time experience, that his ancestors have become carrion worms taking the shape of men, camouflaged in their daily life in the town, and secure in their maggot-like infestation of the depths below. And, finally, on good starts - so too is the...somewhat different...musical approach. You may well have missed the fairly obscure 2014 debut of this Dutch duo ('An Idol Carved Of Flesh'), released as it was through equally obscure Malaysian label Eastern Voice Production, but that was essentially an anarchic Trad Doom vehicle, with a few hints of Black Metal, some cool effects, and a lot of vocal content delivering narrative lyrics in a wide variety of recitative/ritualistic/incantational voices. It was raw, a bit thin on production, but undeniably eerie and effective, and, perhaps more to the point, it stuck to H.P. 's actual writings. Well, I'm rather pleased to see that 'The Festival' not only carries on in that vein, but improves on it in many subtle and not-so-subtle ways. The album, at heart, simply tells the original tale: Swampcult haven't messed around reinterpreting it, or cherrypicking parts of it, they've just cut it into chapters and put it to music. The backbone of that is a simple combination of lead guitar and drums, both quite minimalistic, with the former often as basic as finding a vaguely Sabbathian riff and sticking to it for a while, and the latter clattering away behind it, frequently in a sort of contrarily contrapuntal rhythm. Layered over that, vocals range from gibbering to whispers, chants to spoken-word, but most often settle into a slightly blackened and histrionic harsh-edged clean declamation. Weird ambient and spot effects, odd off-key synth melodies, laughter and background voices are folded into the atmosphere, ably assisted by a much-improved production, full of body and depth, that brings out all of the detail hidden within the tracks. And, guess what? It really does work, much as you might expect it not to. From opening track 'The Village' - sounding like it might be about to burst into 'Symptom Of The Universe' - to the off-kilter ambient denunciation of closer 'Betwixt Dream And Insanity', the music has all the dark delirium and surreality of Celtic Frost reinterpreting 'Sabotage', and, at the same time, conjures a genuine feel of Lovecraft's strangely-distorted, indifferently hostile cosmos of horrors. At times the effect-enhanced narrative qualities remind me of the bardic Irish Doom project Ohdaith: deep and evocatively unsettling, not least when reading verbatim the excerpts from the Necronomicon that provide the story's denouement.